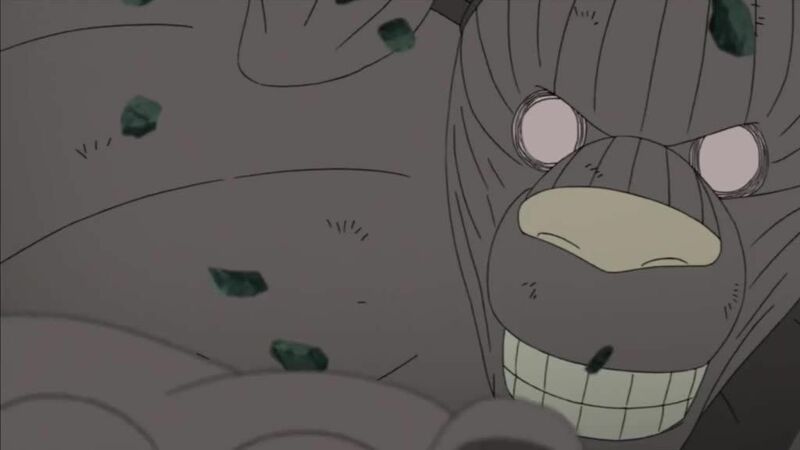 Bent on stopping Naruto and his allies from interfering with the Gedo Statue as it begins to regenerate back into the Ten-Tails, Tobi engages Naruto and Guy while latter is able to create an opening for the youth to land a blow. As Tobi is distracted, Kakashi attempts to use Kamui on the Gedo Statue before it was suddenly nullified to his confusion. By then, Naruto fails to land his attack as Tobi separates him from the others to get the upper hand. Rushing to Naruto’s aid, Kakashi launches his lightning-imbued kunai at Tobi before forced to warp the kunai away when the villain changes its trajectory towards Naruto. However, Tobi finds a slight fissure appearing on his mask that the others notice as he erects a barrier around the Gedo Statue to hinder Gyūki. Analyzing the masked man’s abilities, Kakashi asks the group to aid him in testing his theory to confirm that Tobi has been using one technique the entire time in this fight: the exact same Kamui as himself. When asked where he got his Sharingan from, Tobi upsets Kakashi by claiming to obtained it while from battle at the Kannabi Bridge. As Tobi states there is no more hope for the world, Naruto rejects his views and Kurama — who briefly takes over his Jinchuriki’s body — declares that Minato sealed him within Naruto to give the youth the power to take him down. With that as he gives the youth back his body, the Nine-Tails tells Naruto to charge Tobi head on.